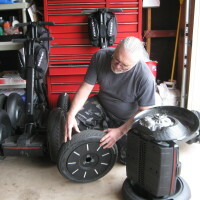 Even the Segway Personal Transporter (PT) gets an occasional flat tire. However, unlike an automobile, the remarkable Segway is electric – totally emissions free – AND is 11 times more energy-efficient than the average American car. Besides, Segway PT’s can take you places that a car can’t!! !